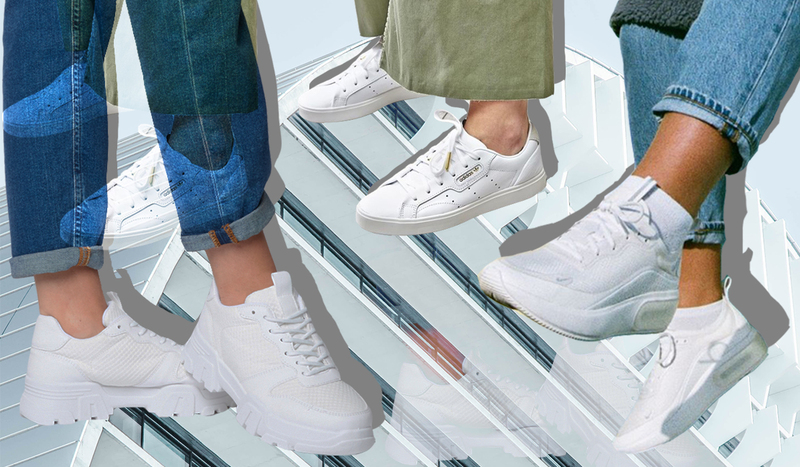 White is set to be a huge trend this season, and whilst it might seem daunting to throw on a pair of bright white ankle boots, we’re going to show you the many different ways you can rock a pair of white shoes all the way through this season and beyond. From sandals to cowboy boots, we’ve got the white trend covered. White trainers are a classic spring staple, and a must-have in our wardrobes at this time of year. 2019 has already brought us some great new styles tailored specifically for women. Both the Nike Air Max Dia (£105) and the Adidas Sleek (£69.99) have a slimmed-down profile and a slightly pointed toe, adding a feminine touch to the styles. 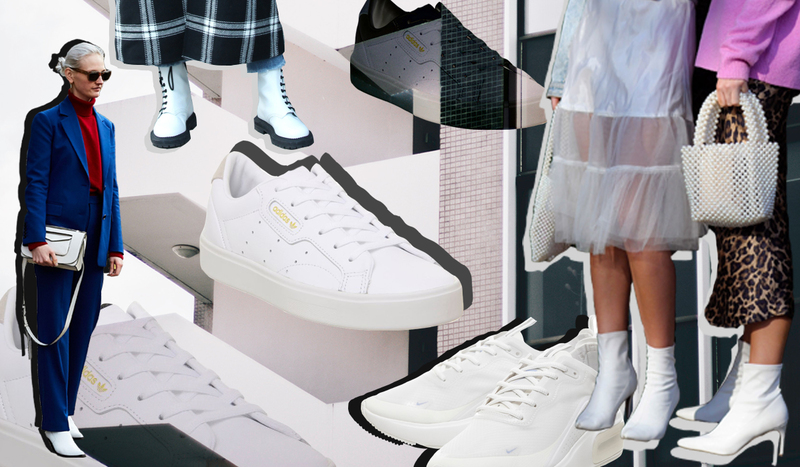 If you love iconic trainer styles like the Stan Smith or Air Max 1, these new shapes are the perfect way to switch up your style. In keeping with the chunky trainer trend, the Fast Pace Chunky Lace-Up Trainer (£39) is completely monochrome and gives a minimal feel to the trend. With a textile mesh upper, these are the perfect lightweight spring trainer. If you prefer flats, spring is the perfect time of year to try out exciting new shapes, with new styles dropping all the time. One of our favourite so far this season are the Frolic Point Flats (£65). In a super-soft white groucho leather, these flats are the perfect shoe to take you from work to dinner without compromising on comfort. If you’re planning a trip away, or live far away from London’s cold weather, then the Solar Big Buckle Mules (£55) are the perfect payday treat. 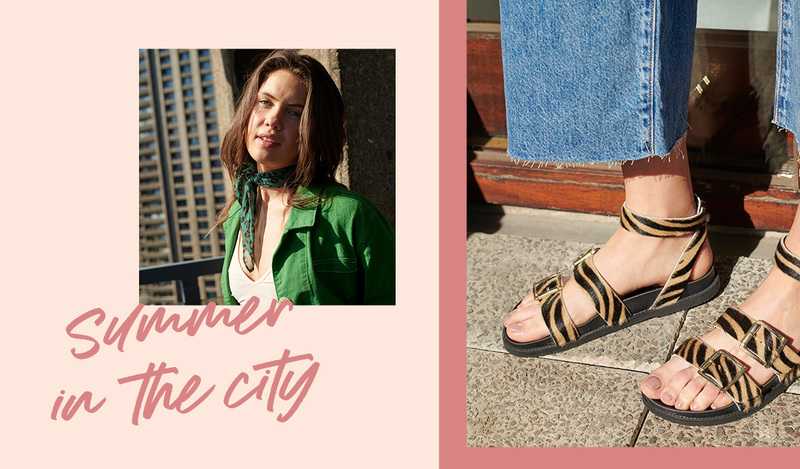 These sandals are perfect to dress any outfit up or down, whether you’re walking to the beach on your holidays or having a stroll through the city. The extra-large gold buckle detailing adds a touch of glamour without overpowering the soft black and white colour palette. Or, for those who want something minimal yet modern, the new Sandy Two Part Sandal (£45) ticks all the boxes. Staying on-trend with the minimal scandi-styling, but adding a contemporary twist with a clear strap, Sandy is sure to be a staple in your summer wardrobe. The less-is-more style means that you can wear these with just about anything; be it a midi skirt, shorts or your favourite pair of denim jeans whilst the weather is still on the cold side. Already organising your summer social calendar, or planning your outfits for a season of weddings, parties and celebrations? Look no further than a white heel to take you all the way through till autumn. White is the perfect versatile shade, so you can switch up your outfits for a different look each time without having to find a new pair of perfect heels. Our current favourites are the Mansion Extreme Chunky Mules (£59) which are perfect for someone who wants the classy look of a heel without any of the discomfort. The super chunky heel gives added comfort and stability so you can dance all day and into the night without having to go barefoot. If you like more of a classic shape, then the Marigold Strappy Sandal (£49) are the ideal wardrobe staple. The adjustable ankle strap gives you full support without covering the foot, and a mid-height four inch block heel gives you style without compromising on comfort. Finally, if it’s something current and on-trend you’re looking for, look no further than the Mirror Transparent Wedge (£52). 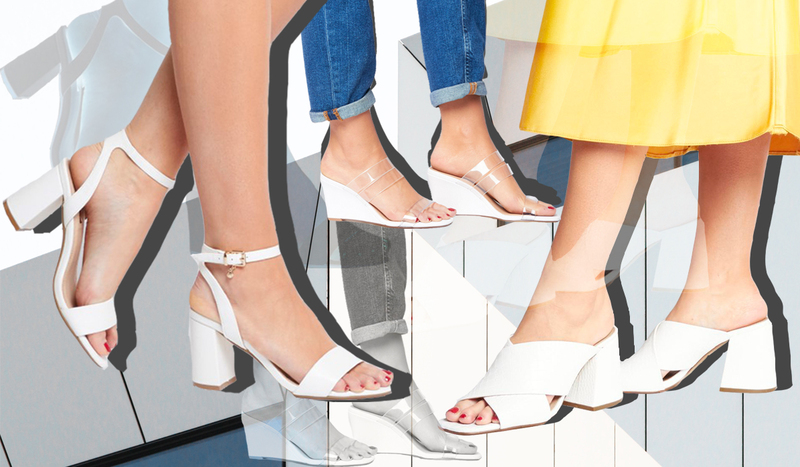 The barely there triple transparent straps contrast with the bold block white wedge to create a modern, sophisticated heel that will look great with any outfit. We love this wedge for daytime drinks with a pair of blue jeans and a knit jumper.